The South Korean government will decide on its participation in the Trans-Pacific Partnership (TPP) within this year, Minister of Trade, Industry and Energy Paik Un-gyu was quoted as saying on May 9 by Japanese newspapers. 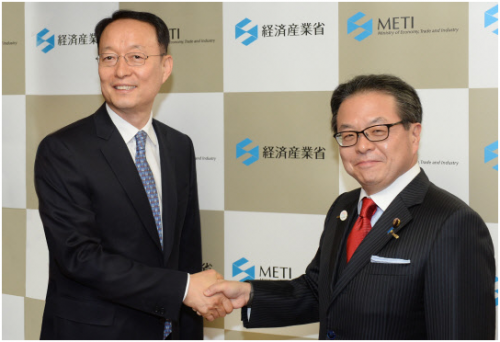 According to the Ministry of Economy, Trade and Industry of Japan, the South Korean minister met with Japanese Minister of Economy, Trade and Industry Hiroshige Seko in Tokyo on May 8 and discussed details regarding the TPP. The TPP is a multilateral trade agreement in the making by Japan, Canada, Mexico, Malaysia, Peru, Chile, Vietnam, Brunei, Singapore, Australia and New Zealand. Thailand has expressed its intent to participate and Taiwan and Colombia are also showing interest. The South Korean minister said that the South Korean government is looking forward to a forward-looking relationship with Japan. The Japanese minister said in response that the two countries would exchange more opinions for closer economic ties. The two ministers also mentioned that the two countries would make joint efforts so that the Regional Comprehensive Economic Partnership (RCEP) of South Korea, Japan and ASEAN member countries can reach a conclusion within this year. In addition, the two ministers agreed on more cooperation for a stable supply of energy sources such as LNG and for a smooth transition to future energy sources such as renewable energy and hydrogen.